I know she's not European medieval--but she's awesome looking so I added her. So I set out to discover everything I could about the art of medieval sword fighting. Shocking as this may seem–nothing we see in the movies is accurate. Basic things, like never turn your back on an opponent. Then how is one supposed to do a mid-air turn and plunge? Or never lose contact with your sword, which makes those toss your blade, turn, kick, catch and jab scenes just silly. I thought I’d share a few real-life and totally awesome sword fights with you. Secondly, we have my personal favorite — the making of the Princess Bride sword fighting scenes. You don’t love the Princess Bride? Inconceivable! Yeah, I knew all the movie stuff was crap! I’ve never bothered to research sword-fighting because a blow by blow swordfight description isn’t very interesting anyway. The gaps should be filled in with emotion and other action. I DID, though, have to research Japanese jujutsu for my fantasy assassin. 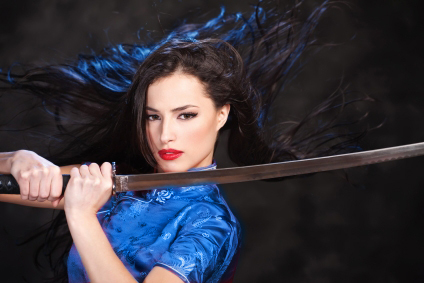 And before that, I had to research martial arts in general so I could pick one that worked best for her! I now know more about fatal strikes (points of the body that can cause death when struck properly) than I ever needed to know…. Ah…and author after my own heart–writing female jujutsu heroines! Which series? I’d like to check her out, but wasn’t sure from your website? It’s true that most movies … well certainly most modern movies just go for style rather than accuracy and that’s fine because the fight exists to build tension not to portray accurate combat techniques. But the clip below is an awesome example of a sword duel… one that rivals the Princess Bride though its a little more brutal in the end. Fights in fiction need (in my view) to convey both emotion and accuracy insofar as it does describe the action. If you’re going to write about a fight then at least have what the combatants do plausable within the context of the world you have created. Some research is crucial to getting that right. Thanks for the post. It’s a subject I am quite passionate about. Great video…yeah a little gory at the end for someone faint of heart! LOL! Point well taken on accuracy. You are the first one I’m coming to for the realistic details. Love this topic. Yeah I came to realize the same thing, so we have to learn while we can. I also decided that next year I will take up fencing to get into the role for one of my books. To make it believable we have to gain as much knowledge as possible. Oh! Carlyle, what a brilliant idea. I wish I lived closer, and we could go together. 😉 Film it and put it on your website for your fans! Great post. Sword fighting in fiction is one of my favorite things in the universe.